Hi, I have a custom product set of forms that allow the user to choose one of two options (although this could grow). Depending on whether they choose A or B (let's call them), the price is different. I would like there to be a conditional that then feeds to paypal upon submit a different price for each. I know I could have the user choose the product, but this won't then inform the other options. So I would like to have the ability to add two paypal options (single item) with conditions as to which is used based on selections above. Let me try to explain why I want to do it this way and not with a multi-product selection. I have a form I'm building for custom flutes. The customer can choose one of two types of flute model, one costing more to produce and I want a different price for that. However, there is more to choose: tunings. The thing is, not all tunings are compatible with all models. So, I first have them choose a tuning, and using conditions, I offer forms on which models they can order based on that. Some tunings can have both, some only one or the other. So, I can't setup a single "choose your model" field, as it depends upon the tuning. I could just have all the possible combinations there to select in one huge multi-product field, but then the user must do this, and mistakes could be made, whereas when I use the conditions, I "idiot proof" the selection process. I am afraid that we do not have any easy solution for you. At this time JotForm does not support Multiple Products With Multiple Choices order integration, and it is not possible to use multiple payment methods on the same form. 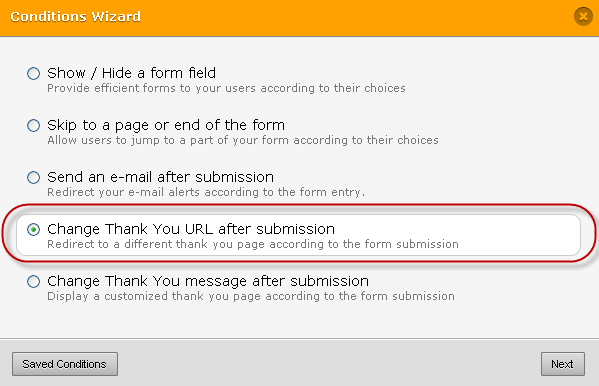 The possible solution is to redirect each user to separate form for each product based on choice options using "Change Thank You URL after submission" option. We hope for your understanding in this matter.